From standard shipping cartons to specialized corrugated storage bins and file boxes, we stock a wide range of sizes, weights and styles. We can even create custom boxes through our BoxAwesome program. 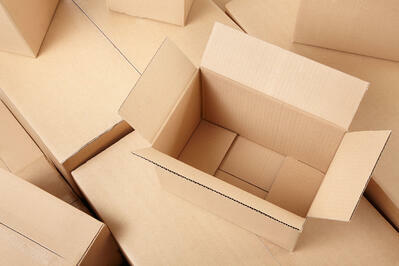 Here are some of the most common corrugated box styles in the industry. The RSC is the workhorse of the carton industry—your standard shipping box, available in dozens of size and material combinations. RSC boxes are made from a single piece of corrugated called a "blank." They ship flat and are scored along the fold lines for easy assembly. Unfold it, close the flaps, seal it with packing tape and send it on its way. This box is the same as an RSC, except it does not have top flaps. It may come with a separate corrugated lid that can slide over the top once assembled. These make great reusable storage containers. They are often found in sizes that accommodate legal or letter size files. Sturdy double-wall lidded file boxes of this type are often called "banker's boxes." 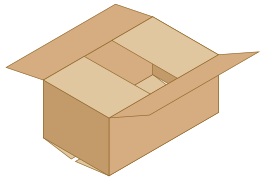 These boxes have outer flaps that partially or fully overlap when folded. The overlapping material provides extra support for heavier loads so that the bottom won't break out. This style improves box integrity for boxes whose length is much greater than their width. They are often closed with heavy-duty carton closing staples instead of packing tape. Snap lock boxes (also known as 1-2-3 bottom boxes or quick setup boxes) have specially dye cut bottom flaps that lock together when the box is set up. This eliminates the need for packaging tape or carton closing staples on the bottom of the box, significantly speeding up box assembly. Faster setup can really speed up production on manual packaging lines, but you should be aware that the bottoms are not as strong as a standard RCS carton sealed with high-quality tape. 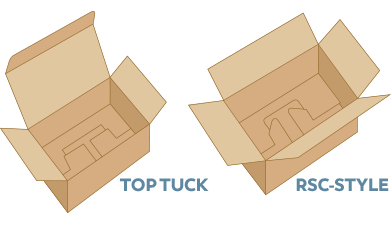 Snap Lock boxes come with either Top Tuck closure or RCS-style top flaps. 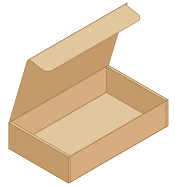 These boxes consist of two parts, a bottom piece in which contents are placed and a top piece which slides over the sides of the bottom piece to serve as a lid. In Full Telescope Design (FTD) containers, the lid extends 2/3 or more of the way over the bottom piece. 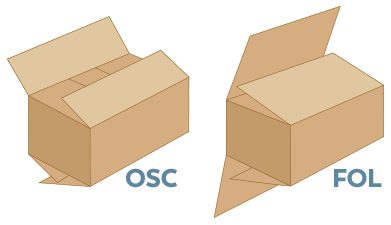 Boxes with shorter lids are known as Design Style Containers with Covers (DSC). These boxes are created from a single sheet of corrugated that is folded along score lines to create the box. 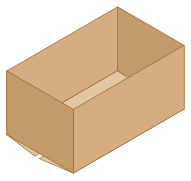 Unlike RSC containers, this creates a box with a flat unbroken bottom. The flaps fold up to create the sides and top of the box. Some styles of folders are then closed with tape or staples, but others snap together with slots and tabs or tuck flaps. Pizza boxes and literature mailers are great examples of one piece folders. Need Help Finding a Box? Looking for something special? If you're not sure which box style is right for you, or don't see what you're looking for, contact us. We're happy to help!